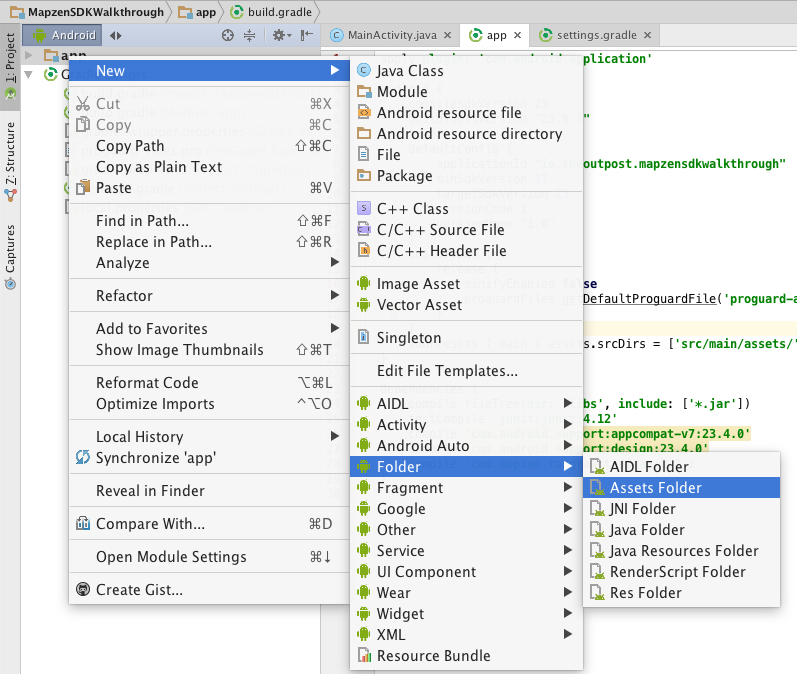 The Tangram Android SDK is a Gradle package that makes it easy for you to include Tangram ES in an Android application. Keep in mind that this is different from the Mapzen Android SDK. The Mapzen Android SDK is a wrapper that includes all of Mapzen services in your Android application. That includes other projects like LOST, On the road, and Pelias, as well as Tangram ES. There is a good walkthrough on getting a Tangram ES map working in Android via the Tangram Android SDK. However, I have some additional notes that helped me get the Mapzen Android SDK working. Note that this is the build.gradle (Module: app). Now that we have created this directory, I put the bubble-wrap project in that directory. We do this same path with having the assets directory setup as described above.